Whenever halloween comes along, there is no other Filipino (being) that is more popular than the "Aswang". Every Filipino gathering wouldn't be complete without the mention of one. For the most part, these beings are mythical creatures but millions of Filipinos throughout recorded history have sworn to them being real, yes even up to this age of the internet and social media, which the Filipinos are king. Books, movies and tv shows have been made about these fantastic creatures which sometimes goes by the name of "tik tik or "wak wak"". According to stories, these beings are indigenous to the islands of the middle part of the Philippines but there would be tales where they were seen in the southern parts and the lower upper parts of the country. Of course according to some tales (movies and tv shows included) they have also infiltrated many parts of the world. They are for the most part, shape-shifters as they seem to be quite normal and unassuming people in the day time but change into creatures straight out of your wildest dreams or even into wild animals at night. They are also often depicted as grave robbers or fresh flesh eaters or even ghouls who feast on unborn fetuses -- sucking them from the bellies of unsuspecting sleeping pregnant women. "Aswangs" are also said to be like witches or other ghouls of Philippine mythology and are often likened to vampires and werewolves rolled into one. History tells us that even during the Spanish times (1500s to 1800s), stories of the "aswang" have already been widespread. It is also noteworthy to add that we shouldn't get it past those Spanish friars of old to make up these spooky stories to scare the natives, so they would be easier to subjugate or to stop them from having secret meetings or incursions at night. Anyway, true or not, if you are interested in finding out more about this interesting and uniquely Filipino beings, here is the "aswangs" as depicted by the creators of Grimm the TV Series. If those short clips, left you craving for more, then here is a full length documentary made by the "Aswang Project". Those who speak Tagalog would have no problem finding several "aswang" movies. Many will remember that since the 1980s, there have been a lot of Filipino movies made which tackle the "aswang" phenomenon, including the ever popular Shake, Rattle and Roll series. Here is one of the more recent films about these creatures. Moro School, Zamboanga, Mindanao, P.I. 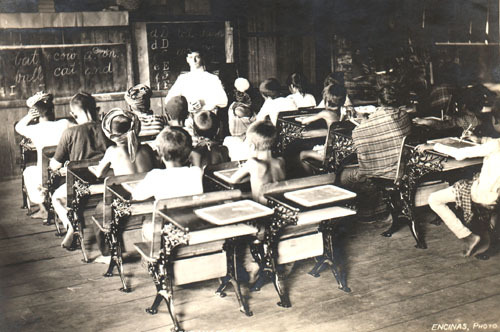 In 1901, the United States of America established a public school system to be implemented throughout the entire Philippine archipelago. 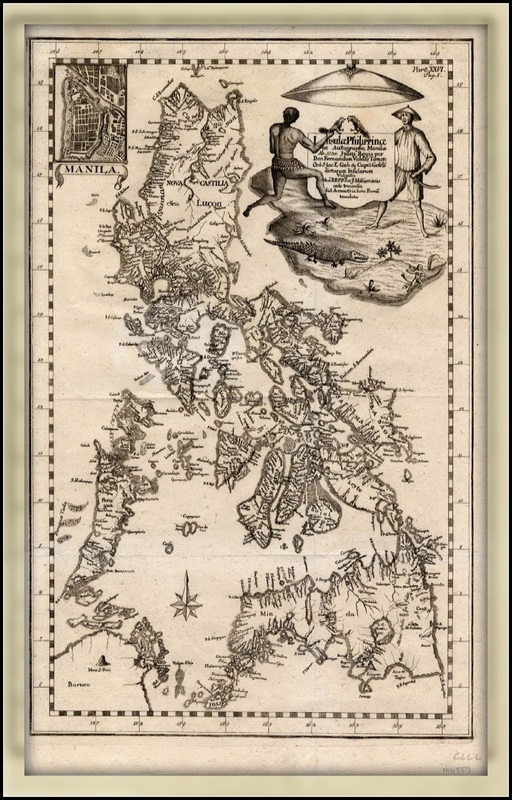 They shipped in American teachers and dispersed them to the different provinces that make up the Philippine Islands. These teachers taught Filipino students the same curriculum as in the U.S., in the English language. The teachers came by way of a US Army Transport boat called "Thomas", the first batch came August 1901. Hence, these teachers got the nickname "Thomasites". By 1903, Americans started sending selected Filipino students to the United States to actually study in U.S. high schools, colleges and universities. This practice lasted until the start of World War 2. All if not most of these students came back to the Philippines with their diplomas and all the learning and the experience they received in the U.S. mainland. And some of them became the country's next teachers and educators themselves. Fast forward to 1999, numerous U.S. school districts in major cities in many states are having problems with the hiring of qualified teachers, some with having no applicants at all. It got from bad to worse and school districts had to "import" teachers from a handful of countries. And you guessed it, many came from the Philippines -- talk about coming full circle. The teaching profession have always flourished in the Philippines since the post war era. We can say the same thing about professions involving accounting and its allied courses, nursing and other health careers, care giving, domestic work and related fields, sea faring, blue collar,skilled and entertainment jobs as well as call center, business processing and IT consulting -- which basically make up the bulk of Filipino workers who are being contracted to work overseas. In 2011 PBS aired a documentary titled "The Learning". This was about the face of this imported teachers phenomenon and it followed the story of four Filipino teachers who left their careers and their families to teach in Baltimore, Maryland. What the casual reader might be missing here is that even though these teachers might be receiving salaries which are 10 times more than what they would receive in the Philippines (which is probably the only reason why they would be doing this in the first place), is that they were sacrificing a lot by leaving their careers, their pensions, their homes and their families to travel and live half-way around the world. And to come teach children in a country where they couldn't find anybody local to do it themselves. This is very similar to the sacrifices the "Thomasites" had to go through when they sailed from the United States in the early 1900's, leaving their American lives, their comfortable homes and their friends and families to teach people in another country where everything is very much different from what they were used to. This old saying is is true, you reap what you sow. Today Filipino teachers are repaying those brave, naive and idealistic American teachers who taught their grandparents by going to the U.S. and teaching their grand children. And they themselves are enduring sacrifices which those American teachers had to go through. To these pioneering teachers, we salute you for your service and for helping educate the next generation of people who will come after us. Many Filipino teachers across the U.S. right now have been receiving awards and recognition and they are proving that they deserve to be teaching American school children today and for years to come. This is a noble duty, wisely planned. Behind, your work will not have been in vain. 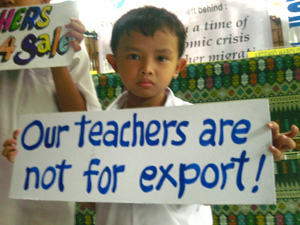 May our Filipino teachers abroad be guided with the same sentiments. Notable Filipinos. Awesome Inc. theme. Powered by Blogger.